When three Brooklyn-based tech entrepreneurs discovered they needed to sell off a chunk of their startup, MyBankTracker, in order to survive, they decided to find an alternative. What they came up with was an in-house mobile app design service and strategy agency that went on to attract clients like Christie’s auction house and South Beach Diet. “We went back to our product development roots and we offered to build products for other people,” says co-founder and CEO, Alex Matjanec. Since spinning out of MyBankTracker in January of 2017, the agency, called AD:60, has continued to grow swiftly, maintaining 45% year-over-year revenue growth for two straight years, last year generating more than $5 million in revenue. Matajanec founded MyBankTracker.com in 2008 with Jason Reposa and Tadas Nikulin—two friends formerly with Night Agency, a digital solutions company. The new company’s online product allows customers to compare the offerings of various banks in their geographic regions, so they can find the ones that best suit their needs—“Expedia for bank accounts,” explains Matajanec. That product, though, is an attractant for site visitors that inevitably come face to face with ads and special offers from some financial institutions, making the site a powerful marketing platform that generates revenue. Through 2016, AD:60 and its dozen employees would only take on three or four projects at a time, including building apps for music streaming company Songza (acquired later by Google), account management tool ACE Portal, and investment tool Stash Invest. Despite success, the agency saw room for improvement. “We were not growing as quickly as we should have been because we just weren’t focused on marketing ourselves like you should a standard business,” says Matajanec. That changed in 2017 when AD:60 spun out as a separate agency, with Matajanec at the helm, leaving Reposa to oversee MyBankTracker. 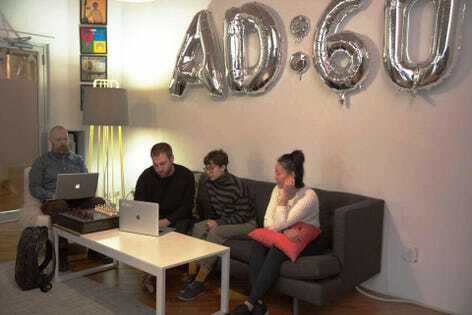 Though it hasn’t surpassed the original company in terms of revenue – a closely held figure – AD:60 soon became the more dynamic and talent-heavy of the two businesses. Its personnel count is expected to hit 40 by spring 2019, while MyBankTracker stands at only about 12 employees.